Japan and Russia have agreed to hold talks to end a territorial dispute which has prevented them from signing a formal treaty to end World War II. The agreement came as Japanese Prime Minister Shinzo Abe visited Russia for the two nations' first top-level talks in a decade. 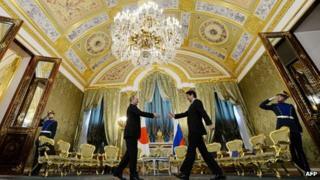 In a joint statement, he and Russian President Vladimir Putin said the lack of a treaty was "abnormal". The dispute centres on four islands north of Japan's Hokkaido island. Japan calls them the Northern Territories. Russia calls them the Southern Kurils and has controlled the islands since Soviet troops seized them from Japan at the end of World War II. No details of the leaders' agreement were given after their talks, but they said they had instructed their foreign ministries to "step up contacts" to discuss the various options, and that they were determined to overcome "existing differences". "The talks on a peace treaty agreement in the last few years have been in a state of stagnation," said Mr Abe at a news briefing in the Kremlin. "We managed to agree that we will renew these talks and we will speed up this process." "I consider this a great result of this meeting," he said, adding that the two leaders had "established personal, trusting relations". Mr Putin said the agreement "does not mean that we will solve everything tomorrow if the problem has not been solved for the past 67 years". "But at least, we will continue work on this complex issue, but one that is so important for both sides," he said. Russian Prime Minister Dmitry Medvedev has visited the disputed islands twice in recent years, causing anger in Japan. In February, Japan scrambled fighters in response to what it said was an intrusion into its airspace by Russian fighters near the islands, as Mr Abe made a speech on the territorial row. Energy was also set to be discussed during the talks in Moscow, as Japan works to diversify its energy supply in the wake of the Fukushima nuclear disaster that has left almost all of its nuclear reactors suspended. It is already a major importer of liquefied natural gas, including from the Russian Far East island of Sakhalin. Possible Japanese investment in a liquefied natural gas hub in Vladivostok, connected by a pipeline to gas fields in East Siberia, could be discussed, reports say. Prior to this visit Junichiro Koizumi was the last Japanese leader to visit Moscow, in 2003. After Russia, Mr Abe heads to Turkey and the Middle East.